Writing is the most in-demand skill out there today. That might come as a shock coming from the owner of Proofread Anywhere, but it’s true. Text is the #1 way we communicate, and having good writing skills will set you wayyyy apart from the crowd. If you’ve been reading my emails lately (and if you haven’t, sign up here! ), you know how passionate I am about mastering your writing skills. People who can write well can make bank — plain and simple. Take my good friend, Yuwanda Black. You’ve seen her on the blog before chatting about SEO writing and her writing courses. She’s super popular with y’all, and I’m thrilled to have her back on the blog today to talk about… writing romance novels. Yep. Romance novels! 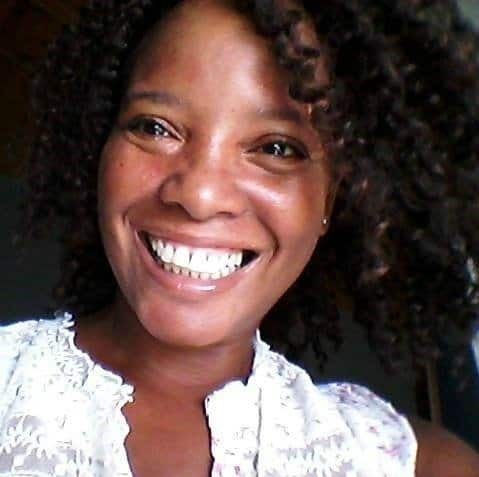 Yuwanda has written and self-published over 40 romance novellas. 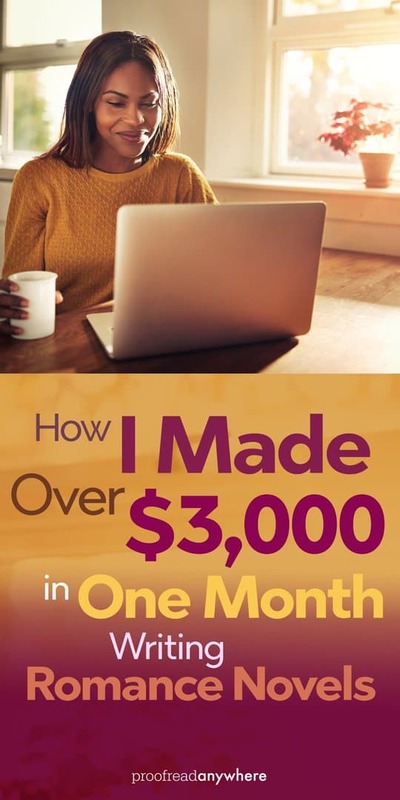 She’s gotten so good at it that she’s now making thousands of dollars a month. If making some serious cash like that sounds good to you, read on to get the inside scoop on how Yuwanda does it. Before 2013, I’d never written a romance novel. That year, I wrote my first one. I had no experience. I had never taken a writing class. Nothing. Just an idea, a Google search for “how to write a romance novel,” and my determination to get it done. If I can do it, you can, too! But before we get into the why and how of it all, let me back up a minute. I’ve been a freelance writer since 1993, and have written over 50 nonfiction, how-to eBooks. So yeah, I had some writing experience; but let me tell ya, writing fiction is as different from writing nonfiction as an elephant is from a tiger! They’re both animals in the wild, but that’s where the similarities end. Same with fiction and nonfiction writing; they’re both writing, but that’s where the similarities end. So don’t go thinking, “You have writing experience, so that’s why you did so well.” It’s not — not at all. And that’s why I firmly believe that if I can learn to write romance, you can, too. Here’s why I did it. One of my sisters is a writer, too. Unlike me, however, she’d always written fiction; never romance, but fiction nonetheless. She went on a trip to Texas one time and said an idea for a romance novel came to her on that trip and it just wouldn’t let go. So, she wrote it — in about a week. It was short story, about 65 pages by Amazon’s Kindle page count. She uploaded the book to Amazon, not even thinking about whether it would sell or not. She was just glad to have it out of her head. But to both our surprises, she started selling copies! 10. Refresh screen. 13. Refresh screen. 22. Refresh screen. In less than a month, my sister sold over 500 copies of her first romance novella, earning her about $1,100. Neither of us could believe it. As both of us are self-publishers of many nonfiction, how-to eBooks, we know what it takes to sell books: time, persistence, a catalog, some marketing elbow grease, etc. Or so we thought! So I promptly banged out a shortish (about 30,000 words) story and uploaded it, eagerly waiting for my sales to start rolling in. But mine bombed. I sold 8 copies that first month. That was the beginning of my romance writing “career.” The reason I put the word career in quotation marks is because I probably never would have taken the time to dig into romance writing and learn what it takes to succeed had I not had that flop. It was a year before I wrote another one, but between 2013 and 2016, I wrote 42 romance novellas — all between 10,000 and 30,000 words. My best month, I earned exactly at $3,200. Here’s what — in my opinion and experience — it takes to really make good money writing romance. And keep in mind that the best part of this career is that you can get started with zero dollars. My sister had written an interracial romance. My first novella was an African American love story. So when I wrote my second romance novella, I plopped an interracial couple on the cover. And guess what? Sales. I sold 241 copies of that second romance the first month. So genre does indeed matter. When I published my first eBook in 2002 (before self-publishing was “a thing”), it didn’t even have a cover. It was a nonfiction, how-to book; a simple PDF file download of some info I’d put together that my blog readers had been asking me for. Those days are gone. You need a quality cover that looks professional. Romance Novel Cover Tip: You can find some great book cover designers at reasonable rates on Fiverr. It’s my go-to site for jobs that are beyond my technical skill. In love, they say absence makes the heart grow fonder. Well, it doesn’t work that way as a writer of love (romance author). Readers will forget you in a nanosecond, especially when there are so many other authors putting out great work. When I got serious about my romance writing career in 2013, for about a year and a half, I published 3 to 4 novellas per month. Yeah — about one every 7 to 10 days. And every time I’d put one out, I’d see a push in sales of my other books — even if the current one wasn’t a great seller. Now, I’m not saying you have to publish this frequently, but in my opinion, you can’t put out one book a year and expect to make decent money writing romance. Sure, you could luck up and have a runaway seller that’ll allow you to kick back your heels for a bit, but if you don’t publish frequently, readers will forget you. You have to constantly feed the romance reading beast! And luckily, romance readers are prolific readers. According to the Romance Writers of America, 64 percent of romance readers read romance more than once a month, and 35 percent buy romance more than once a month. Also, over a third (35.1%) have been reading romance for 20 years or more. So finding readers is not the problem when you write romance; give them stories, and they’ll buy. One of the biggest mistakes I made early in my romance writing career was not taking the time to put out a professional product. I got dinged on minor grammatical errors — errors that never should have been there. Like I said above, I was writing and publishing a lot, and I was proofing my own work. This is almost never a good idea, by the way. Anyway, even though I’d go back in and correct the errors, those Amazon reviews stay there forever. So build in proofreading and editing time — even if it means delaying publishing by another week or two. Put out the best, most professional book you can. Start building your reader mailing list from day one. Many self-published romance authors have launched themselves at the top of Amazon’s list based on this alone. How? They’ll send their book to their readers, asking them to leave reviews. The number and quality of reviews are factored into Amazon’s ranking algorithm, so it can help your book climb the charts pretty quickly. Also, the money… you can make a very good living just from your list if it’s big enough. Imagine having a list of 3,000 and just 5 percent of them bought your book on the day it’s released. That’s 150 sales. And if you price your book at $3.99 and place it on Amazon, you could earn over $400 just by sending an email out to your list. Amazon pays authors 70 percent of all eBooks priced between $2.99 and $9.99. So you’d earn roughly $2.79 on each copy sold. $2.79 x 150 = $418. You’ll notice that I’ve reference Amazon a few times. It’s because it’s the largest marketplace for self-published authors. Many authors have a love/hate relationship with them, but the bottom line is, you need to publish there to make good money writing romance. Here’s a little secret — notice how “excellent” or “great” writing isn’t on the list? While I don’t want you to think that you can be a bad writer and make money writing romance, you don’t need to be a great writer — just a good one. Following are two reasons why. Love is a universal emotion that all of us can relate to. Hence, if you can create characters who are believable and relatable within a realistic plot, you have a chance of building a readership. The readership is there, as the statistics from Romance Writers of America cited earlier highlight. And here’s one more stat for you: romance is the best-selling fiction genre of all time. It outsells crime, horror, sci-fi, and religious/inspirational books by a wide margin — the other categories that round out the top five fiction genres. Apparently, the old adage is true: “There’s no substitute for love.” And there’s no reason you can’t capitalize on it by writing those love stories readers flock to read. Writing romance novels might not be on everyone’s radar, but it is a legitimate way to earn money and learn new skills. With such a vast audience consuming romance books left and right, the demand is there — why not take a piece of that pie for yourself? Thanks for allow me to connect with your readers again Caitlin. I love appearing here! I went to Yuwanda’s site and it reads This is a FREE ECOURSE ecourse, so I am a little confused. Is it free or does it cost $197.00? This is a FREE course. The only reason there is a payment option is you can get a discount by PRE-PAYING for the full version of the course, which will open for enrollment on November 15th. So again, the course is FREE, but you can choose to pre-pay for the full course (and get a discount). The full version of this course will be open for enrollment on Wednesday (11/15). Hi Yuwanda, am really inspired by this blog. I would really love to write romance stories and sell them on amazon one day. I have the passion for writing but sometimes I really get discourage because I hear from people it’s not easy and very demanding.. Anyway, am taking your free course now. I’m glad you enrolled in the free romance writing course. It’ll answer a lot of the questions you have about how to make money writing romance. As for “I hear from people it’s not easy”; forget “people.” You will ALWAYS have somebody who’s ready to shoot down your dreams. Most ppl are well positioned to take the “why it can’t be done” stance. It’s b/c most are programmed to follow the “normal path.” If you want to live a life that “colors outside the lines;” ie, doing your own thing, then you’re gonna have to learn to tune out”people” and find those who are supportive of your dreams. If you have questions as you go through the course, feel free to send them in.